Quidnovi: "The World As I See It"
"The most beautiful experience we can have is the mysterious. It is the fundamental emotion that stands at the cradle of true art and true science. Whoever does not know it and can no longer wonder, no longer marvel, is as good as dead, and his eyes are dimmed. It was the experience of mystery -- even if mixed with fear -- that engendered religion. A knowledge of the existence of something we cannot penetrate, our perceptions of the profoundest reason and the most radiant beauty, which only in their most primitive forms are accessible to our minds: it is this knowledge and this emotion that constitute true religiosity. In this sense, and only this sense, I am a deeply religious man... I am satisfied with the mystery of life's eternity and with a knowledge, a sense, of the marvelous structure of existence---as well as the humble attempt to understand even a tiny portion of the Reason that manifests itself in nature. Francis- have you been reading a bio of him lately? You know, the paper kind---before computers made it all so much more easy to store information. Albert Einstein, along with Bertrand Russell and Gandhi were the catalyst of an era which believed that the human spirit would eventually triumph over humanity darker side and would eventually make the world a better place for all. Familiar with two but Bertrand Russell i need some help though I have at least heard the name. 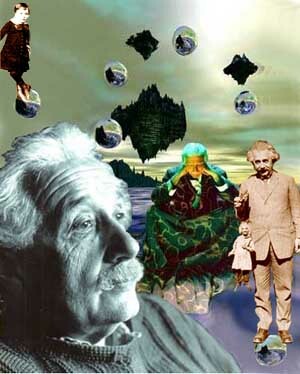 I also put King with Gandi and Einstein. Let me go google. Do you recommend anything specific concerning Russell? In his introduction to Martin Luther King Jr's Nobel Peace Prize address, the Dalai Lama, winner of the 1989 Nobel Peace Prize, said: "Despite their quite different backgrounds, Dr. King has joined Mahatma Gandhi as a continuing beacon of inspiration to further peaceful revolutions in recent years that, in turn, offer future generations a wonderful example of successful, nonviolent change. What both these great men affirmed is that the desire for both peace and freedom lies at the most fundamental level of human nature and that violence is its complete antithesis." "for competition we must substitute cooperation". How does this work for poker? 11 Mar 2003 @ 20:41 by quidnovi : Cards?